I don’t recall where it first was that I stumbled across a recipe for albondigas… Maybe in one of the five food magazines that I subscribe to, or on the internet or even on television… but the recipe kept sticking in my head. 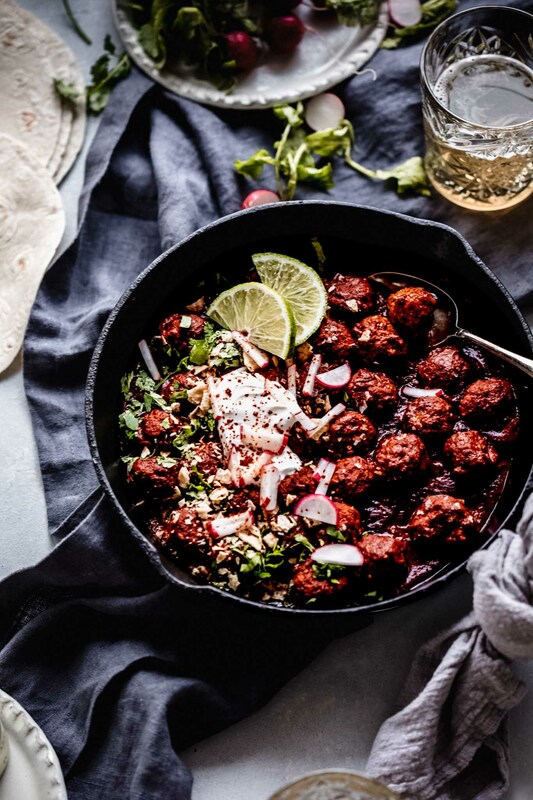 These albondigas were beef meatballs that simmered away in a richly spiced enchilada sauce… I was thinking that they’d be good served over rice or as a party appetizer. What I found when searching for albondigas recipes was primarily soup – A Mexican brothy soup served with meatballs… Not those saucy meatballs that I remembered. So, I dug in further and found that in Spain and Latin America, meatballs are called albondigas, derived from the Arabic al-bunduq (meaning hazelnut or a small round object). 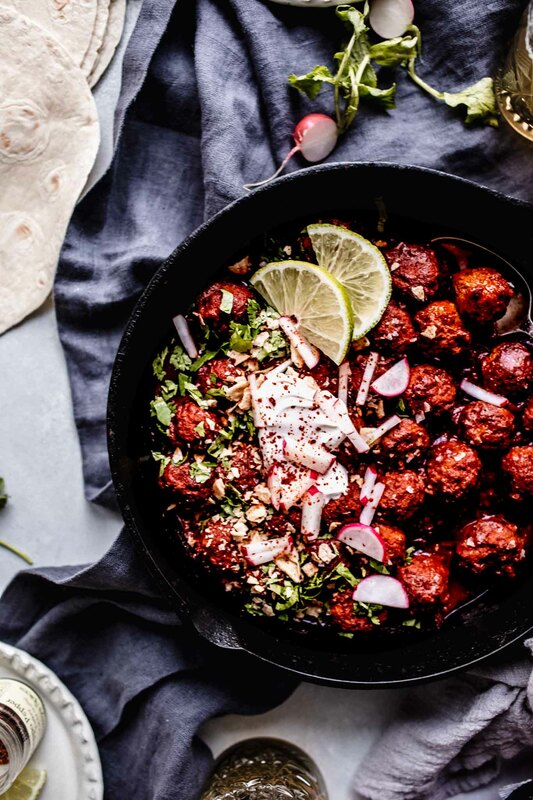 Spanish albondigas can be served as an appetizer or main course, often in a tomato sauce, while Mexican albondigas are commonly served in a soup with a light broth and vegetables. It all started making more sense. Starting with point number one: In order to get loads of flavor into these meatballs, I wanted to season them from the inside out – Foregoing the traditional breadcrumbs that you’d use in meatballs, and in sticking with our Spanish theme, I chose to use crushed up corn chips instead. I also threw in some onion, which helps to keep the meatballs moist, garlic, and a good amount of cilantro and cumin. You’d be happy eating these meatballs on their own, but the kicker was coming next. Here’s where I took a shortcut – sticking with point number two – I chose to use canned enchilada sauce. Enchilada sauce can be quite time consuming to make at home and it calls for quite a few ingredients. So, I cheated a little bit. 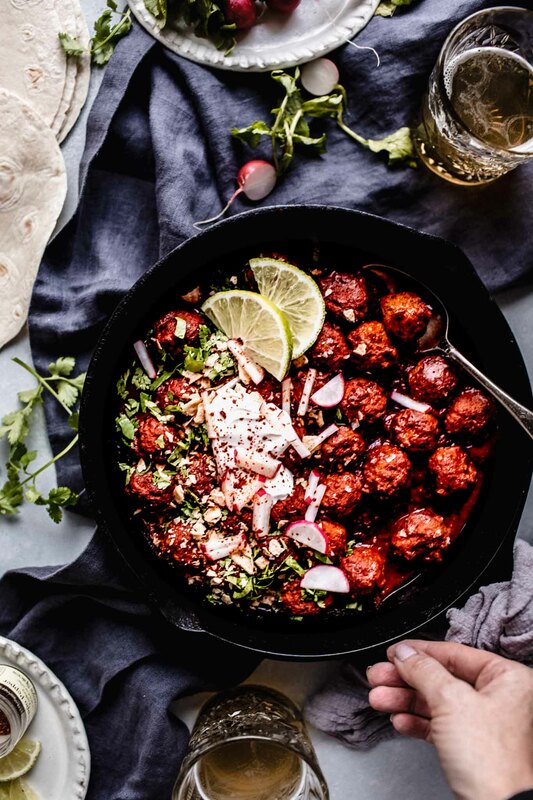 I added in a big can of sauce, enough to cover the meatballs in the skillet about halfway and then I let it all simmer together for about 20 minutes – The meatballs season the enchilada sauce as they cook away and, conversely, the sauce seasons the meatballs. The result is a nicely thickened, seasoned sauce that’s mild in heat but big on flavor. I topped these albondigas simply, with a sprinkling of crushed tortilla chips, sour cream, radishes and cilantro. 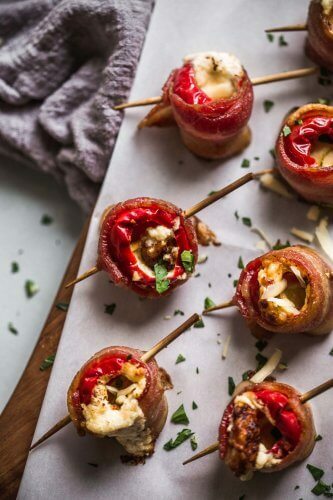 But, they would also be amazing with a hearty sprinkling of cheddar cheese over the top. If I had some avocado on hand, I might add some of that on top too. These beauties are begging to be wrapped into a tortilla and eaten like a taco. But, they’d also be amazing served over a bowl of steamed rice. In this case, I chose to serve them as a game day appetizer – served straight from the pan with toothpicks on the side for easy snacking. How would you serve these albondigas? If you loved these albondigas I would appreciate it so much if you would give this recipe a star review! Also, be sure to snap a picture of your finished dish and share it with me on Instagram using the hashtag #platingsandpairings and tagging me @platingsandpairings. Mexican Meatballs - or Albondigas - simmer in enchilada sauce and are topped with sour cream, radishes & cilantro. Serve them taco-style in tortillas or as an appetizer with toothpicks. 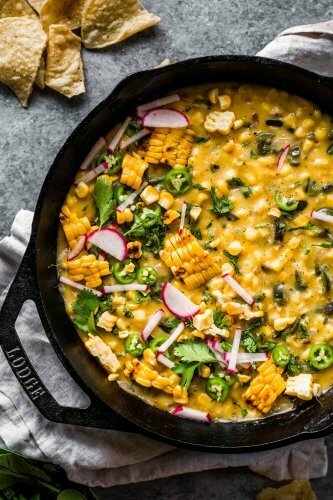 Stir together corn chips and milk in a large bowl; let stand about 5 minutes or until chips soften. Stir in onion, garlic, cilantro, cumin, eggs, salt and pepper. Fold in beef. Shape into 1 1/2-inch meatballs (about 2 tablespoonfuls each). Evenly space meatballs on a cookie rack set in a deep sided baking sheet or on a broiler pan. Bake 10 to 12 minutes or until browned. Transfer meatballs to a large skillet or Dutch oven; add enchilada sauce. Bring to a boil over high heat. Reduce heat to medium, and simmer, covered, for 15-20 minutes or until meatballs are cooked through. Remove from heat, sprinkle on cheddar cheese, cover pan, and let stand for 5 minutes before serving. Serve meatballs with tortillas and desired toppings. Tips: These meatballs can be made ahead of time. Simply bake them and place them in the freezer. When you're ready to serve, just put them on the stove with the enchilada sauce and add an additional 10 minutes to the simmering time. Try a Sangiovese with this dish – It’s flavors of roasted peppers and tomato are echoed by the enchilada sauce, yet it’s light-bodied and fruit forward enough to not be overpowering. A Tempranillo would work well here as well. It’s a mild wine that works well with the spices in many Mexican dishes. Love the idea of the corn chips instead of bread crumbs!!! Sounds like great timing – I hope she loves them Lucy! 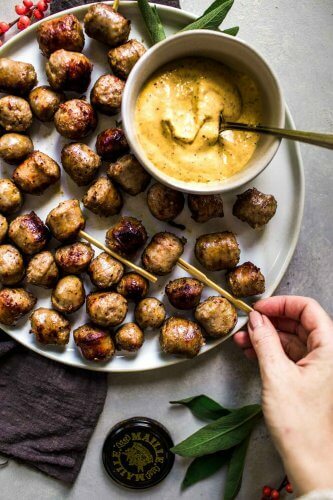 I love this as a unique take on a familiar dish (meatballs), especially for a party. I bet they’re a real crowd pleaser! Thanks Catherine – Both kids and adults love them too! Thanks Megan – I hope that he loves them! This is a beautiful dish! I’m a spice wimp but I bet I would love this. Great wine pairings too! I’ve never even heard of albondigas . . . and I’m fairly certain I wouldn’t know how to pronounce it. 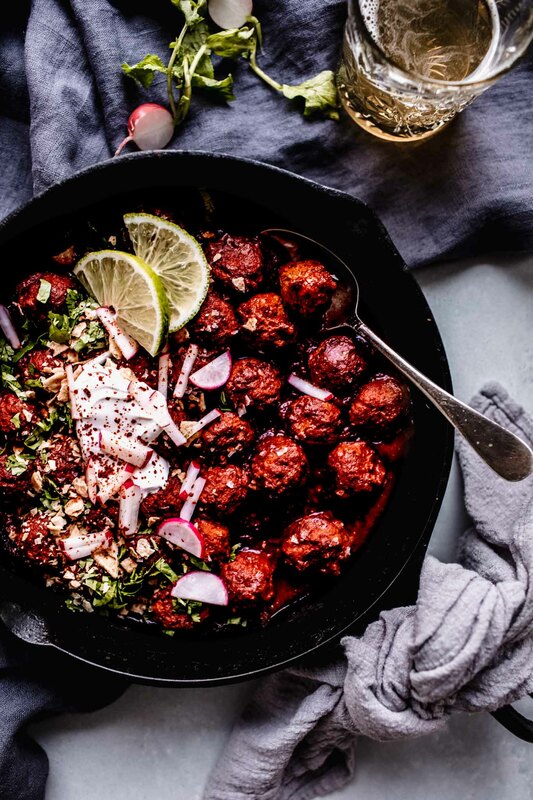 I have a serious meatball obsession right now and these are next on my list to make! Wow, oh wow do this look amazing. This is a different way to make albondigas. The photos are outstanding, and the colors are so vibrant and beautiful! Thanks so much Carlos – Yes, I learned that there are many, MANY different ways to make albondigas! 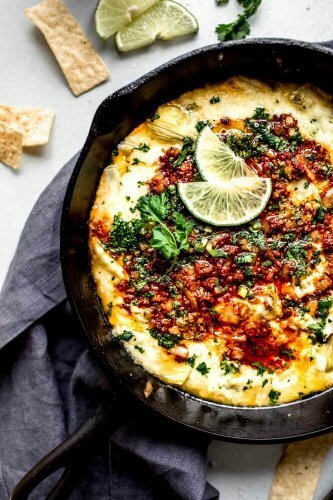 Oh boy, does this recipe look “up my alley”, or what! I’ve tried to see if I am missing something, but I don’t see a temperature for the oven baking of the meatballs, before simmering. Thanks for catching that Jeff – They should be baked in a 400-degree oven. The recipe has been revised to reflect that. I hope you enjoy and thank you for stopping by! Hi Gina – It’s a 28-ounce can.